Spin is a dirty word in the public relations world. Unfortunately, it is the term most used to describe the work of PR practitioners. The countless hours of behind the scenes work that these professionals perform (myself included) is often-times discounted when a scandal arises, “just bring in the PR folks to spin this and make it all better.” Yes, crisis management is indeed a function of PR. No, PR professionals are not spin doctors who can wave a magic wand and make your problems disappear. So, what is PR and what do these magicians actually do? What does that even mean? Let’s go back to that crisis. Imagine a company of which you are a loyal customer. For me, it’s Amazon (I am a proud Prime user). Amazon has always provided me with great service. If Amazon messes up my order, it’s cool. They’ve gotten it right with me a lot of times and I feel we’ve built a relationship. Therefore, I’m more willing to forgive Amazon and continue to use their services. That is the power of PR. Through a variety of methods, the organization (Amazon) has developed a mutually beneficial relationship (they get my money, I get what I need) with the publics (that’s me!) on whom their success or failure depends (no me, no money, no business). Seems kind of simple, right? The not-so-simple part goes into the relationship building. While this blog is way too short to develop a full PR plan and explain the myriad factors that go into this plan, these six basics will point you in the right direction. Identify your publics. Who do you want to build relationships with? This could be employees, customers, stakeholders, Board of Directors, patients, etc. What do you need to achieve with these publics? Generally, this will relate back to a business goal. Are you trying to get them to purchase a product, attend an event? What messaging will you use to communicate with each public? Tailor messaging to fit each group. You wouldn’t necessarily communicate the same way with your employees as you would with your stakeholders. Identify the methods by which you are going to deliver these messages. This can include email, website, social media, traditional media, direct mail, fireside chats, etc. Set short term and long term goals. For example, do you want 10 employees to attend an event this year and 250 employees in attendance over five years? Establish tools to evaluate your efforts. This step is critical. How do you measure your success? Is increased satisfaction your goal? Establish a satisfaction survey. Is event attendance your goal? Don’t forget to have someone count the attendees. This is just the tip of the iceberg in the PR world, but hopefully it helps explain what PR is and how you can start building relationships with your publics. 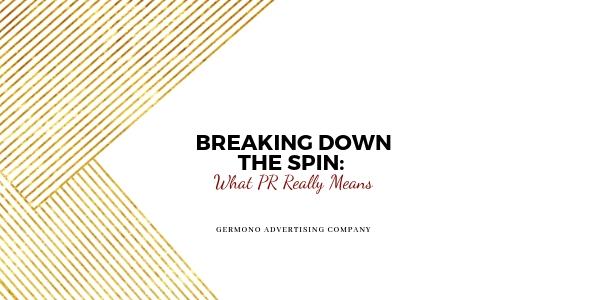 For more PR tips, catch me on Facebook live tomorrow at 12:30 p.m. EST @GermonoAdvertisingCompany. Come prepared with questions. I’m eager to assist you! And if you have any questions or need a custom PR plan, contact me for a marketing coaching session! My email is Jennifer@Germono.com.